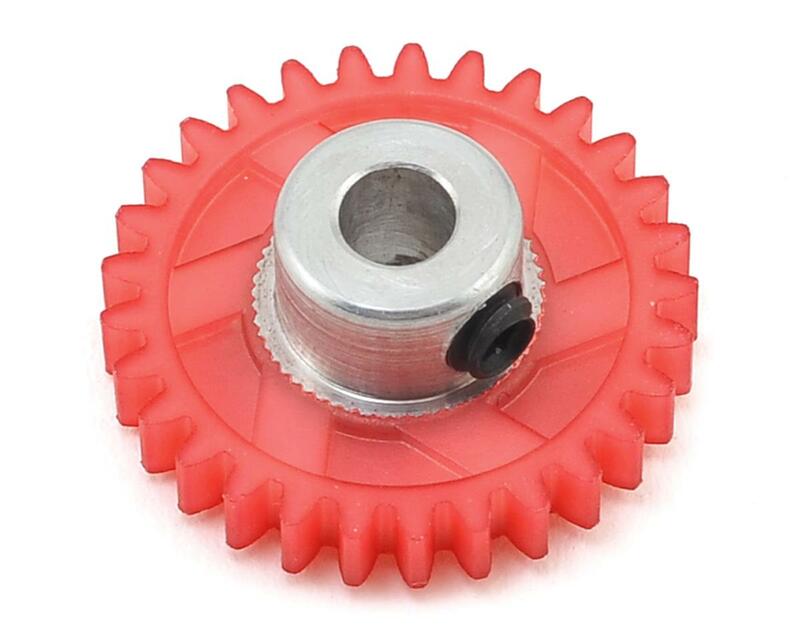 The 175RC Polypro Hybrid 48 Pitch Pinion Gears feature a hybrid design that combines an aluminum center hub with a non slip molded Polymer Gear. 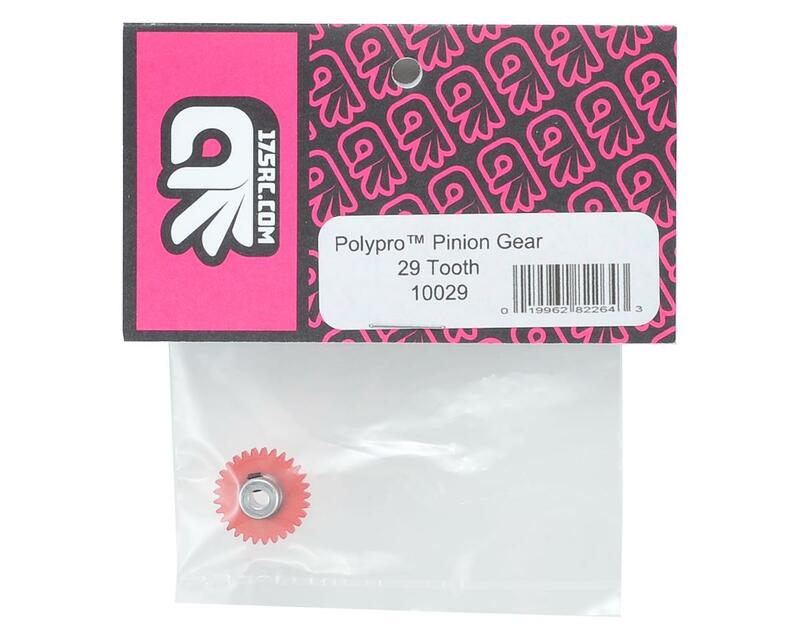 The molded tooth profile is much smoother than a typical machined metal gear and provides a quieter and smoother running gear train. Plus, the lightweight of the hybrid design has been proven to increase acceleration off the line and out of the corners, as well as improve the overall feel of the power delivery and efficiency when compared to heavier standard pinion gears. Amazing pinions. I use it in 17.5 2wd buggy and 13.5 4wd buggy racing. Great pinions! Have not had any issues so far with them. Lighter than any other pinion you can find. Perfect for 17.5 racing. Would not use for mod racing. Love these pinions! Running them on my B6 w/ a 13.5T. I wouldn't go lower than that. Also, I used a fine tip sharpie to write the number on the metal of the pinion. It would be nice if they had it stamped, but we adapt. I did also have trouble like the guy who gave one star. My 29 tooth came unfastened after one run and became attached to the motor and kept working. It took a lot of work to free it without doing any damage to the motor or pinion. Still love them, they just need some QC. Simply Amazing !!! Color Coded for quick tooth recognition..Very Smooth. Works great on my B6.1 17.5 wheeler. Light weight and quieter running gear train. Just a tip, I have only metric tools - and you`ll need a .050" hex driver for the set screw. Very good pinions. I was worried about the durability/reliability issue because they are "plastic" but i haven't had a single one strip or chip teeth yet. I have been using these pinions for about 3 months with no issues. The only thing that came up was a difficulty in removing the pinion from the motor. I had to use a 90 degree pick to remove it. Other than that, I love these things. The price is great as well at 4.99/ea. Pinions seems solid to me. Haven't had any issues with them in my 17.5 t5m. Exotek just released an ultra light pinion design that looks really cool. I thought about trying it in a size that I don't have, but they weigh in around 1.1g. With that being said, 175rc is still the lightest pinion available and half the money, so I'm sticking with them. It makes the most sense. Awesome product! So far put in around 500 laps with this in my RC10B6.1d in an indoor clay track. It makes your drive train super quiet! and quiet means efficient. I'll probably order a few more with more teeth once I get more consistent lap times to get more speed down the straightaways. These come color-coded to indicate tooth count. Should be stamped with tooth count too. For the 31 tooth version. 1 of 7 customers found this review helpful.